With Pantone's announcement of not one, but two pastel 'colors of the year', we decided to feature the underdog. With our recent obsession of Scandinavian decor, we've been spotting a lot of Pastel Green. The calm, soothing hue creates a nice effect against gray and white, warmed by wood accents. It also serves as a compliment to one of our favorite finishing touches, botanicals! Here's how to incorporate Pastel Green into different rooms of your home, and when it's announced as next year's Pantone color of the year, remember where you heard it first! We love the open shelf concept here. Painted a mild shade of sage green, the olive wood and other pastels give it an earthy look. The simple cabinets in this kitchen stand out with the addition of a subtle hue- accented by a marble backsplash and small pops of dark color to add sophistication. From the kitchen, we enter the dining room. This time a pastel green wall against older architectural elements lends a provincial feel. Keep it romantic with lace accents and botanicals in different shades of green. If painting a wall or cabinets is too permanent for you, go for the small things. These ceramic pastel green dishes look lovely against a natural linen tablecloth. Still in need of a less permanent option? Try including dining chairs in unique materials, a pendant lamp, or of course a simple centerpiece of vintage bottles ranging in different shades of green. Top it off with florals and stems for an organic look. After dinner, what better place to unwind than this gorgeous setting. The raw Morroccan elements against the green wall gives us vacation vibes. Some more transitional options for a warm room - a blanket and a pendant lamp make an instant impact in this minimalist room. In the bedroom, how about a Celadon Green linen duvet, to compliment the whites and raw wood elements. This room has the calming effect associated with sea glass and we couldn't think of a better way to end the day. Happy New Year! We are inspired by the many soirees, so we’re sharing some tips on how you can do black in your home. It’s sophisticated, it’s neutral, but it can be hit or miss! Let’s take a look at how you can add a little black in a few of our favorite ways. We love the moody still-life effect a black wall evokes. We rounded up some of the best black walls done right. Out of all the areas of the house, we love a light bedroom. It feels refreshing to sleep in. But have you ever thought about associating the color of night with your bedroom? In this image, the dark washed walls are contrasted not only with natural colors but also natural elements. For a seriously stylish kitchen, consider adding a black tile back splash. 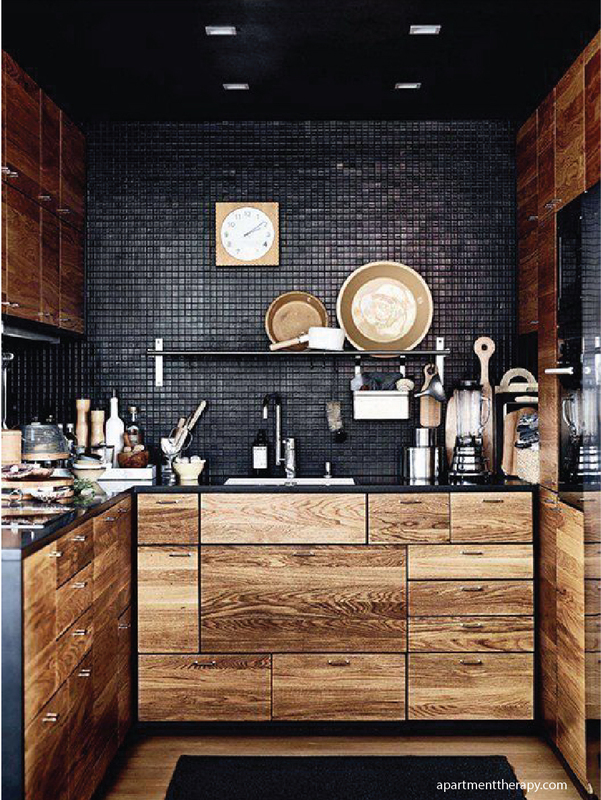 The key to dark colored spaces is contrast, and the warm wood cabinetry in this kitchen does just that. We can’t help but notice a trend in metropolitan flower shops, black walls. We love how the florals bring an unexpected pop to this sophisticated backdrop that still makes the space feel large and gallery-like. Black furniture can really translate in any room. But we chose some of our favorite monochromatic rooms that featured pops of black. The black shelves, lighting and chairs in this kitchen contrast with the white walls to add a sophisticated, elegant feel. Tie it all together with a black and white rug. To keep the accent furniture from being too goth, add shiny objects as a contrast. the copper tabletop and accessories just pop against the moody background. In this office space, the dark objects stage the scene and establish boundaries while the white walls act as a blank canvas. Add minimal sophistication to your table setting with black ceramics on a rustic backdrop. Alternatively, to liven things up, introduce a black poppy print through the linens or even dinnerware. If the black bedroom wall we showed you above is not your cup of tea, try some of these options with a focus on black bedding. Textures can help break up the monotony of a black bed- think velvet, knitted and quilted. Or, you can choose a black print to add more of a playful, bohemian feel to the sleeping quarters.